The Baja 1000 is one of the most grueling off-road races in the world. It is the ultimate endurance test for both man and machine. 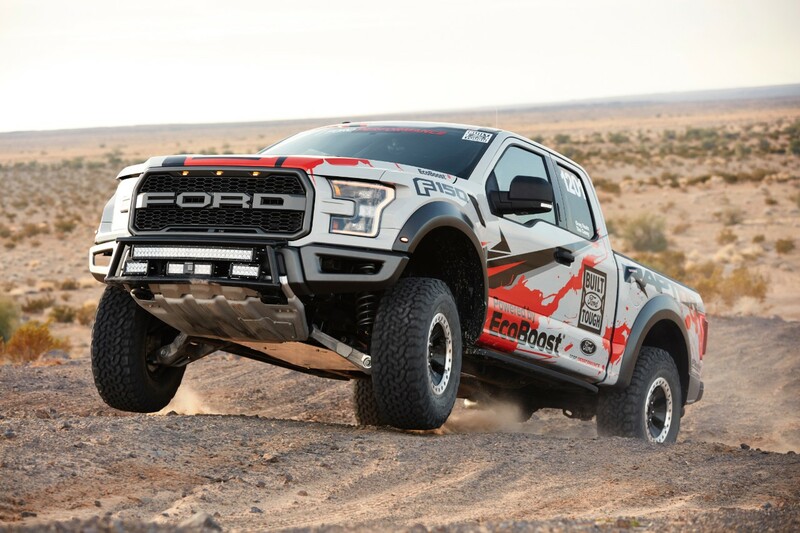 Ford wanted to show the toughness of the new Gen 2 Raptor by entering the race truck that we’ve seen here and there for the past year or so. It’s the same truck that we saw at the Mint 400 earlier this year and have reported on a few other times. It’s won most it’s class in most of the events it’s entered, but it should be mentioned that it usually was in a class all by itself. Well, this time it had other competitors in it’s class and while it didn’t win, it did finish in the allotted time race officials set at the beginning of the race. 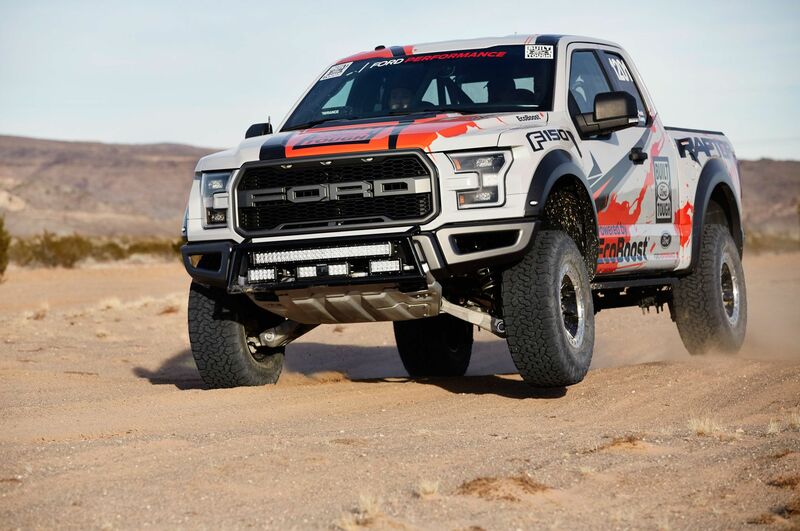 You see, all competitors must complete the 854.5-mile course in less than 36 hours and the new Raptor just barely made it with 35 hours, 39 minutes, 8.1 seconds. Just finishing this race under the truck’s own power is a major achievement for the million dollar trophy trucks, let alone an “essentially stock” vehicle. Now let’s talk about what exactly “essentially stock” means according to Ford. 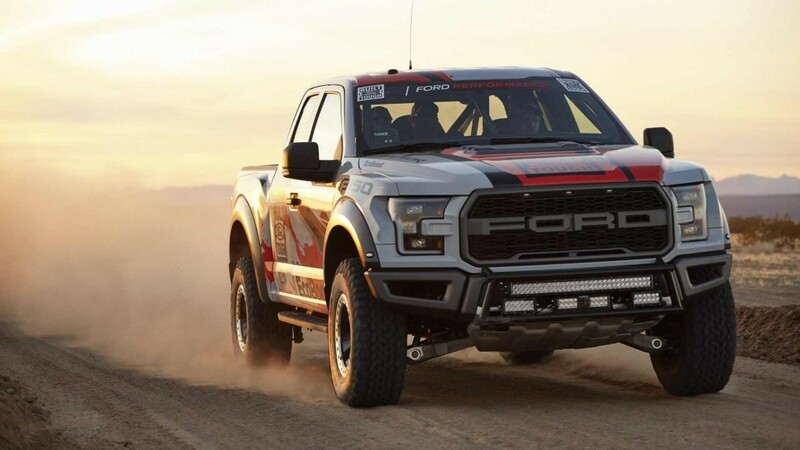 Apparently, the same 3.5L EcoBoost V6 and 10-speed automatic transmission were used as the one that you’ll see in the Raptor driving around town. 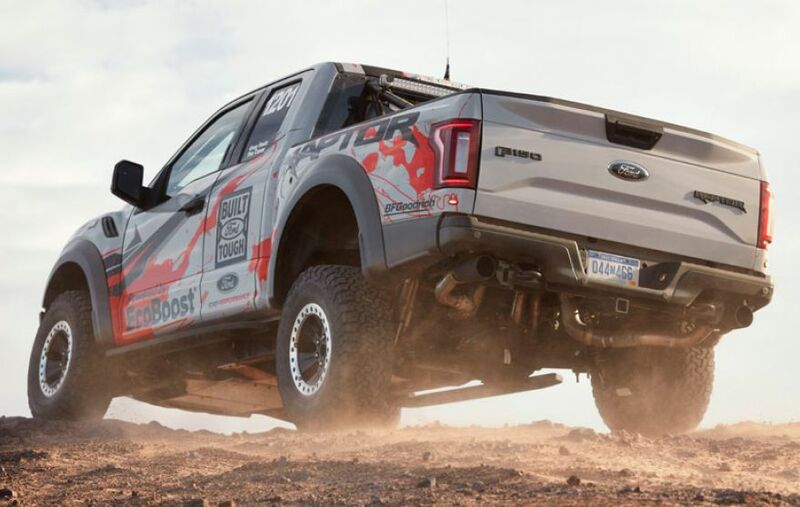 The frame, body, and all major elements of the truck are said to remain the same as the production Raptor, including the BFGoodrich T/A KO2 all terrain tires. Baja race officials require enhanced safety equipment be added in order to allow the truck to race. A roll cage, fuel cell, race seats and 5 point harnesses, plus additional lighting for the night portion of the race. 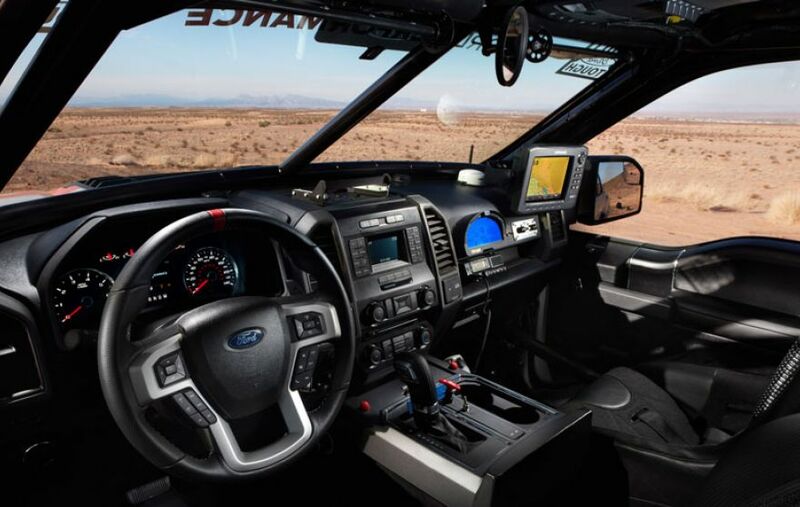 Those additions, especially the roll cage, will add a noticeable amount of weight to the truck so Ford said they had to “revise” the Fox Racing shocks and springs to accommodate the heavier load. No details were released explaining exactly what that means or how much “revising” took place, but Ford is still claiming it’s essentially the production Raptor. So what does this mean and how should we take view as offroad enthusiasts? 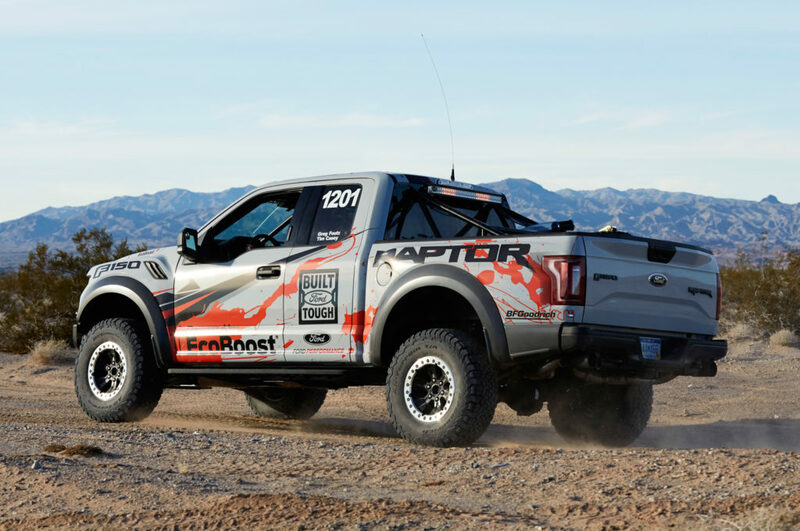 You all know how we feel about this new Raptor and it’s ridiculous V6 motor, or better how much we disapprove of it. 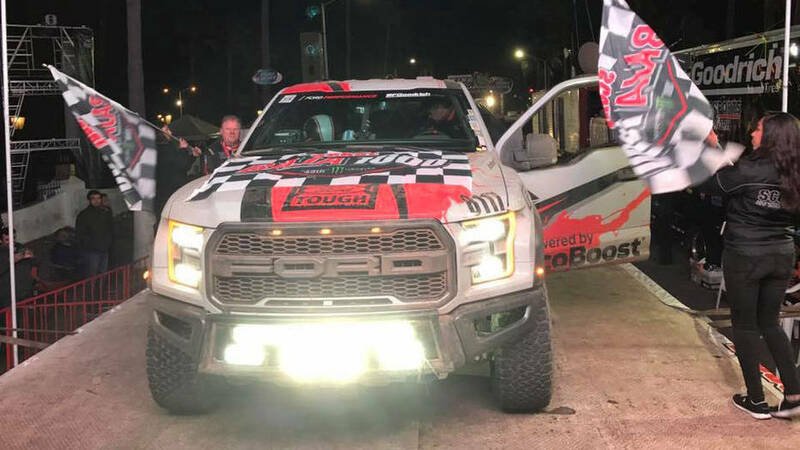 But we have to admit, it’s impressive that this truck even finished the race if it really is the “essentially stock” Raptor. What’s even more impressive is the reports that after finishing the race, rather than pulling onto a trailer the truck was driven home on the roads! That’s one of the things that I first fell in love with about the Raptor. Smashing through the desert at 100mph over whoops and holes, humps, and god only knows what else, then pulling it back onto tarmac and it rides like a damn Cadillac. So does that mean that I’ve caved and fallen into the dark side? Not likely. If anything it just makes me more disappointed because I can’t help but think about how great the Gen 2 could’ve been had they at least given an option for a V8. Better yet, keep with the whole EcoBoost thing but just make it the EcoBoost 5.0 V8! What might’ve had a little bit of sway with me personally is if they would have coaxed more power out of the V6. Here at the Moto Networks office we’re divided on this, particular thing but I feel like if Ford would’ve released it with at least 550hp if not 600hp the EcoBoost V6 would’ve at least made sense. But releasing it with just 450hp, only 39hp more than the first Gen was a big mistake in my opinion. So in the end we want to congratulate Foutz Motorsports for the work they put into this truck and finishing the race altogether. While it may have earned a few brownie points with us for finishing the race, it’s got a long way to go before we’re sold on it.